Preston Craig was born and raised in Charleston, South Carolina, and now lives in Boston, Massachusetts. His work has previously appeared in Glitterwolf and Wilderness House Literary Review, among others. He graduated from Interlochen Arts Academy in Interlochen, Michigan, as a classical guitar major and is currently a junior at Harvard University, where he studies English. This is intimate terrain, a map of the speaker’s memory. On it, we find the body of the beloved as if he were Green Lake itself, his neck like “the mouth of a river” that “opens out into his shoulders.” Since this is actually a poem, though, we also have what is “unwritten on maps”: the associated emotion. It’s in the cracked chair that settles unevenly, the silverfish that scatter, but most of all in that crescent of hair “rotting beneath the heavy soil.” Whatever the reason for the beloved’s departure, Green Lake is abandoned, like the speaker. 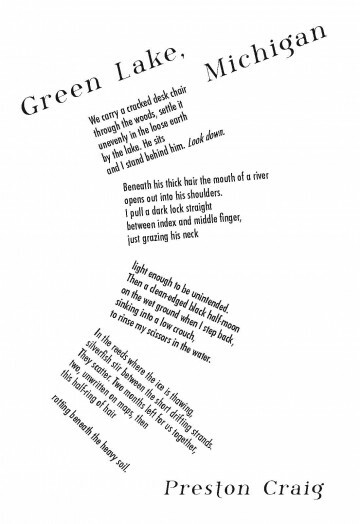 Futura is heavy on the page so that each stanza resembles a clipped lock of dark hair, their collective arrangement in a “black half-moon” like the hair on the ground in the third stanza. Phosphorus’s descenders have a scythe-like quality that could alternately be crescent moons; its contrast between thick and thin strokes on the bowls of the letterforms create more crescents.